Workers using windlasses to pull sheets of blubber off a whale for processing in the sheds behind. Courtesy of the National Diet Library of Japan. Whale meat, which today sits at the heart of Japanese claims for the (legality and legitimacy of) … whaling’s deep cultural importance, was the least of it. Arch shows that whale meat, either fresh or salted, simply did not travel well and was thus of minor dietary importance during the early modern period. But whale oil served as a vital illuminant, other whale products helped the Japanese fertilize and work their fields, and, in one of this study’s most surprising insights, we learn how whale oil was also widely used as a pesticide that allowed the Japanese to intensify rice culture [p. xi]. [W]hile a strong connection between the marine environment and the terrestrial human one may…be found in other forms of pre-industrial and aboriginal whaling, Japan’s case offers a unique perspective because even in the first stages of organized whaling, this was more than just a subsistence activity. The major draw for someone to want to start whaling in the Tokugawa period, the most common popular perception of the goal of whaling groups, was the potential for whalers to become rich. Because the international moratorium instituted in 1986 is for commercial whaling, the focus today in Japan on traditional whaling, and on whaling-related culture such as the consumption of whale meat, is meant to emphasize noneconomic values in order to argue that their whaling is not commercial and therefore should not be banned. But it should not be forgotten that the coastal whaling they evoke with their calls to tradition was a big business in Tokugawa Japan – it was never just about subsistence [p. 191]. 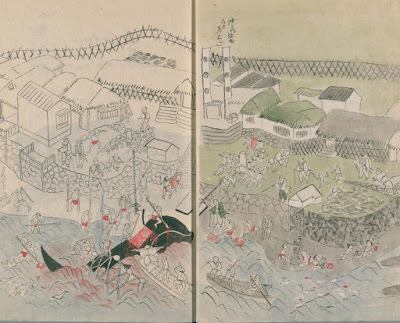 [A]s a growing number of environmental historians have demonstrated for other early modern places and resources, organized whaling in early modern Japan had degraded ecological baselines even before modern industrialized whaling spread throughout the Pacific during the middle of the nineteenth century. This is not a story of a deep historical sustainability followed by modern industrial collapse. And because whales are highly migratory, even near-shore whaling had far-reaching marine environmental implications. It is certainly true that by the time of Admiral Perry’s arrival in Edo Bay in 1853…. industrial pelagic whaling had also diminished Japan’s near-shore whale populations. But Arch convincingly shows us that these outside impositions did not undo a traditional and sustainable Japanese whaling culture. Rather, they intersected with the tail end of an economically sophisticated and culturally rich form of marine resource exploitation, both new to and central to the Tokugawa period, that was taking its toll [p. xii]. Arguments for some kind of cultural attachment to whales and whaling, which try to present Japanese whaling culture as more similar to aboriginal subsistence whaling than to modern commercial whaling, also promote an assumption of sustainability in traditional Tokugawa whaling practices. However, a closer look at the role of whales as a natural resource in early modern Japan complicates this assumption. The reliance of the people of the Tokugawa period on marine resources like whales [herring, tuna, sardines, abalone, octopus and even kelp] to supplement other terrestrial resources that were increasingly scarce in the face of a booming population and economy proves that Japan at this time was not a sustainable closed system, because its marine resources were unbounded…. If Tokugawa Japan was not a closed system, then the lack of human population collapse after a period of high growth cannot reflect an equilibrium of sustainable living within limited means. The newly increased population of peacetime Japan was maintained with continually increasing inputs from the ocean. Meiji Japan did suddenly need new resources as they imported new technologies that required different inputs of iron, steel, and eventually petroleum, but the dynamics of their ever-expanding empire were not as dramatically different from Tokugawa resource use as it might appear to someone thinking that Tokugawa resources were limited to the terrestrial spaces of the islands. Neither state was sustainable without some kind of expansion [pp. 193-194]. It is difficult to know what impact a work of scholarship might have on law and policy. The early modern environmental history of Japan is not everyone’s cup of tea. In this case, however, the framing and argumentation of the book are subtle and sensitive. The writing is clear and strong. And the author’s adherence to the highest standards of her profession is both apparent and appealing. So, one might well imagine that when the International Whaling Commission convenes for its next meeting in Florianopolis, Brazil, this coming September, all those in attendance will be carrying a copy of this book. The delegates there present from Japan will likely be deeply engaged in conversations about how and why they have allowed their history to be so badly distorted for so long. And what they now think the relationship is between the real history of Japanese whaling and the taking of 333 minke whales this past austral summer, and another 43 minke whales and 134 sei whales to be taken by the same fleet in the North Pacific ocean between May and August 2018, under Japan's New Scientific Whale Research Program for the North Pacific (NEWREP-NP).